The new, completely revised, and updated edition of this classic text, published this time by Oxford University Press and edited by Miquel Porta, Head of the Clinical and Molecular Epidemiology of Cancer Group of IMIM, remains the definitive dictionary in epidemiology worldwide. 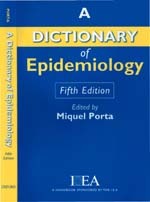 With contributions from over 220 epidemiologists from around the globe, it is more than a dictionary: it includes explanations and comments on both core epidemiologic terms and on other scientific terms relevant to all professionals in clinical medicine and public health, as well as to professionals in the other health, life, and social sciences. Anyone seeking clarity on epidemiologic and methodological definitions important to human health will find them here.